Choose what you'd like to receive information on? Elspeth Lamb studied at Glasgow School of Art, Manchester Metropolitan University and the Tamarind Institute of Lithography, University of New Mexico USA, her main specialism being printmaking. She is an elected RSA Academician, and an elected member of the Society of Scottish Artists and Royal Glasgow Institute, and has taught several workshops in lithography at the Joan Miro Foundation in Mallorca, Spain. She has won several awards for her work, which is also included in major collections such as the Japanese Consular Collection, The British Council, the MAG Collection, and the Joan Miro Foundation Collection, as well as being represented in several Art Galleries and Museums both in the UK and abroad. For 21 years she taught at the Edinburgh College of Art, latterly as Head of the Department of Printmaking and she has been visiting lecturer at many colleges in the UK including the Glasgow School of Art, Duncan of Jordanstone College Dundee and Middlesex University. She chose to give up all academic teaching commitments in 1999 to pursue her artistic career; a recent one-person exhibition was at A.I.R. Gallery in Chelsea, New York City during 2004. Her most recent residencies have been in Bulgaria, Canada and Newfoundland, and she exhibits regularly at home and abroad. 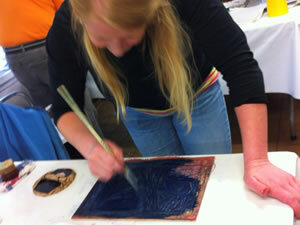 Elspeth studied the art of moku hanga printing in Japan with master craftsmen during 2000, where she was selected to be one of six international artists to participate in a residency based on Awaji Island. Since then, she has returned twice to study Japanese papermaking: this research was related to her publication,’Papermaking for Printmakers’ which was published by A&C Black, London, in May 2006. As a freelance artist, she has organised and taught printmaking and papermaking workshops at many art centres and schools across Scotland, such as Taigh Chearsabhagh, in North Uist, the Leith School of Art, Edinburgh, and the Hunterian Museum, Glasgow University. She works with children and adults of all ages. Why not get in touch? We'd love to hear from you. You can find out more about the cookies we use in settings. You can review the cookies used on our site and learn how to adjust your cookie settings by navigating the tabs on the left hand side. There is no way to prevent these cookies being set other than to not use our site. So you can easily “Like” or share our content on the likes of Facebook and Twitter we have included sharing buttons on our site. The privacy implications on this will vary from social network to social network and will be dependent on the privacy settings you have chosen on these networks. It may be that you concerns around cookies relate to so called “spyware”. Rather than switching off cookies in your browser you may find that anti-spyware software achieves the same objective by automatically deleting cookies considered to be invasive. Learn more about managing cookies with antispyware software. The cookie information text on this site was derived from content provided by Attacat Internet Marketing http://www.attacat.co.uk/, a marketing agency based in Edinburgh.